Features: Currently popular in Europe each pull rope fitness workplace and at home, is a set can be used for running, yoga, aerobics, fitness boxing and overall shaping a comprehensive fitness trainer. Natural latex tube with its excellent flexibility, instead of the usual metal springs. Maximum resistance，you won't be disappointed with our strongest strength, professional exercising resistance bands sets. They are easy to carry, beautiful, practical, low risk and other advantages. Premium quality exercise resistance bands that can be stretched repeatedly are durable. To Help Prevent injuries and protects your face and body Descriptions: It is the best fitness equipment supporting elastic material. Environmental protection, high strength, high elasticity. 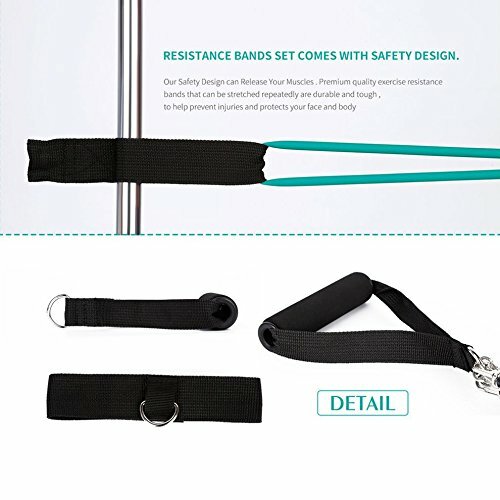 Safety design can release your muscle Specifications: Quantity: 11pcs Material: TPE Function: Comprehensive Fitness Exercise Color:Multicolor Package included: 5 Resistance Bands: 1 x Yellow (10 lbs. ), 1 x Blue (25 lbs. ), 1x Green (15 lbs. ), 1x Black (30 lbs.) and 1x Red (20 lbs.) 1 x Door Anchor 2 x Ankle Straps 1x Carrying Bag 2 x Cushioned Foam Handles Notes: Please allow 0-2mm error due to manual measurement, thanks for understanding. Due to the difference between different monitors, the picture may not reflect the actual color of the item. Please understand, thank you!